We’d love your help. Let us know what’s wrong with this preview of None of My Business by P.J. O'Rourke. To ask other readers questions about None of My Business, please sign up. First, about the subtitle, which reads: "P.J. explains money, banking, debt, equity assets, liabilities and why he's not rich and neither are you." "Rich" is a relative term. Compared to much of the world's population, P.J. O'Rourke IS rich, and so am I. He mentions at one point in the book that he spend several thousand dollars to go deep-sea fishing. Most of the world's population cannot afford to do this (and neither can I). "Explains" is a misleading verb choice. In a book filled with rants mo First, about the subtitle, which reads: "P.J. explains money, banking, debt, equity assets, liabilities and why he's not rich and neither are you." "Explains" is a misleading verb choice. In a book filled with rants mostly aimed at all things modern, he explains precious little. I didn't learn anything about crypto-currency in the chapter about crypto-currency except that it's called crypto-currency. I didn't know that. I still don't have a clue how it works. He explains what the "digital generation" thinks about the digital economy by interviewing his 19-year-old daughter. I like her answers to his questions (selection bias? did she give him the answers she knew he wanted? ), but it's way too small a sample size to offer a valid indication of what the digital generation thinks. At best, it tells us what the 19-year-old daughters of 70-year-old cranky conservative writers think. She may be the only member of that group. P.J. O'Rourke is a funny and clever writer, but after a while the humor starts to wear thin and one longs for some substance. I can't say that there isn't any, but there isn't enough. My favorite parts of the book are those that read more like a memoir. These were mostly toward the front end, when the humor hadn't worn thin. Hezbollah's checkpoints were manned (I should say "boyed") by fourteen- and fifteen-year-olds with AK-47s. They twirled their weapons around, poked them in the dirt, and scratched their ears with the muzzle sights. Gun safety merit badges must go begging in the Lebanese Boy Scouts. "Bassboat!" shouted the adolescent at this checkpoint. When he saw my American passport, he was furious. He stuck the AK-47's barrel inches from my nose. The teenager spoke some English. He subjected me to a twenty-minute tirade about "Great American Satan Devil." I was berated at gunpoint for how America had caused war, famine, injustice, poverty and Zionism all over the world. At last the boy finished his rant. He lowered his gun and gave me back my passport. Then he said, in a normal tone of voice, "As soon as I am getting my green card I am going to Dearborn, Michigan, to study dentist school." P. J. O'Rourke is known for "humorous" writings on a wide variety of topics. 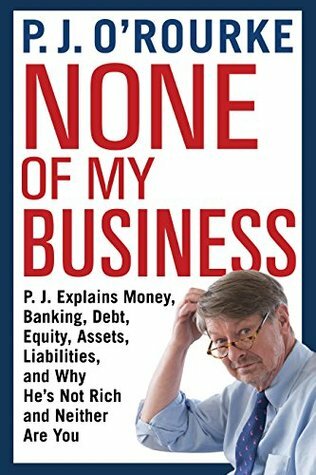 In None of My Business, P. J.tries to provide a off-kilter look at money, economy, mutant capitalism, the digital economy, and consumption. P. J. O'Rourke opens the book with the admission that he does not know how get wealth. But he tries to have fun with discussing economics as a blood sport that he enjoys as a spectator. He then proceeds to have three chapters under the heading "How I Learned Economics by Watching Pe P. J. O'Rourke is known for "humorous" writings on a wide variety of topics. In None of My Business, P. J.tries to provide a off-kilter look at money, economy, mutant capitalism, the digital economy, and consumption. 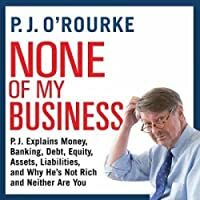 P. J. O'Rourke opens the book with the admission that he does not know how get wealth. But he tries to have fun with discussing economics as a blood sport that he enjoys as a spectator. He then proceeds to have three chapters under the heading "How I Learned Economics by Watching People Try to Kill Each Other"; four chapters under "Money and Banking"; three chapters under "Mutant Capitalism"; twelve chapters under "The Transition"; six chapters under the heading "Consumption"; and finishing with seven chapters under "Random Walk". Basically P. J. O'Rourke has taken everything including the kitchen sink that he thinks he knows about money, economics, consumers and the like, stirs it together, and hung it out to dry. So the reader's enjoyment will depend upon their interest. But the chapter comparing the cost of a middle class lifestyle from the 1950's with today is worth the price of the book. So, if you like P. J. O'Rourke or humorous examination of economics, you may like this book. As a long time fan of P.J., I was a little disappointed. Perhaps our views on life have parted too much for me to really enjoy him anymore. About half of this book has some classic O'Rourke snarky insights viewed through his conservative filter. I enjoy this as his politics and mine don't always agree but I can find the sense in what he says and he says it with humor. But for the rest, I find his view on the world has soured including a seeming renunciation of much of his own youth. He has always As a long time fan of P.J., I was a little disappointed. Perhaps our views on life have parted too much for me to really enjoy him anymore. About half of this book has some classic O'Rourke snarky insights viewed through his conservative filter. I enjoy this as his politics and mine don't always agree but I can find the sense in what he says and he says it with humor. But for the rest, I find his view on the world has soured including a seeming renunciation of much of his own youth. He has always pretended to be a curmudgeon chasing kids off his lawn, he now seems to have graduated to be that person. I picked this book on a whim and it was easily the most humorous book on economics I have looked at so far. It would appear I have a similar sense of humor to the author, so very much enjoyed the book. It is not too serious, but does make some valid points, and could be a way for someone not too interested in the topic to get their feet wet. While I would not use this as a basis for economic policy, the combination of valid information and humor made it a good book. It is a very fast read. My bar was set pretty high for this, and O'Rourke kept a consistent limbo beneath it. I could get more economic insight from any Freakonomics or Planet Money podcast, with almost the same level of humor and without the bitter political opinions. I can get more laughs from an old Lemmings recording, with almost the same level of actual observations and better social satire. It's none of my business how many books P.J. feels the need to churn out; I look forward to hearing him on 'Wait...Wait', an My bar was set pretty high for this, and O'Rourke kept a consistent limbo beneath it. I could get more economic insight from any Freakonomics or Planet Money podcast, with almost the same level of humor and without the bitter political opinions. I can get more laughs from an old Lemmings recording, with almost the same level of actual observations and better social satire. P.J. O’Rourke’s humor is more misses than hits for me, especially now that he is writing from a “grumpy old white man” soapbox. While I had a few chuckles, I grew tired of his repeated railing against things he doesn’t understand, like social media. Perhaps his more dedicated readers agree with his disconnected, somewhat-cynical and snarky view on mobile phones and their apps. If so, I am clearly not his target audience. Big fan of PJ. In fact, I have a signed copy of this book but this isn't his best work. This book reminds me of an old grumpy man yelling "getting off my lawn" to young children having fun. The world seems to be advancing too quickly in such a way that he neither foresaw and can't keep up with. There are a few elements of humor but he's dead serious about his disdain for everything including Snapchat, Forever 21, and anything else you can think of. This is my 5th O'Rourke book. I love his clever and amusing writing, and this book certainly has that, perhaps to the exclusion of substance at some points. While I enjoyed it, it seemed to lack some of the depth of his previous works (but that may have been because I was more distracted than usual while listening to the audio book!). 3.5 stars. Not P.J. at his best but still better than 98% of what else is out there. Having read him since he was at the National Lampoon, he has mellowed over time but I would still read anything that he has signed him name to. This is decent late-period O'Rourke with some of his best and worst ideas. It's as much about himself and his family as the purported subject (money and finance). The copyediting was rushed (perhaps this is a trend in printed books as fewer people buy them). I really enjoyed this book. It was both entertaining and informative. PJ brings his unique view of the world while illuminating some interesting economic observations. This book pairs nicely with his book on Adam Smith's Wealth of Nations. Fun read, but a bunch of columns that are all over the place. Definitely skippable. He's just not all that funny. I thought it would be funnier. Wanted to write a review for this one but I'm out of time. So I'll be brief. Very brief. Here goes. Fun, but not as good as the dangerous travel stuff that he did before he became a parent. Oppikirja siitä, miten kirjoitetaan erinomainen kolumni. Humorous look at economics and politics. Drags a bit in places, but entertaining overall. This review has been hidden because it contains spoilers. To view it, click here. Very much classical O'Rourke insightful and entertaining. This is a wonderful book. The author takes a satirical look at many different topics. Highly recommended and very enjoyable. I didn't realize that this was a collection until I read the afterwards stuff. Mr. O'Rourke is as clever as ever, but this collection doesn't really hang together very well. Patrick Jake "P. J." O'Rourke is an American political satirist, journalist, writer, and author. O'Rourke is the H. L. Mencken Research Fellow at the Cato Institute and is a regular correspondent for The Atlantic Monthly, The American Spectator, and The Weekly Standard, and frequent panelist on National Public Radio's game show Wait Wait... Don't Tell Me!. Since 2011 O'Rourke has been a columnist Patrick Jake "P. J." O'Rourke is an American political satirist, journalist, writer, and author. O'Rourke is the H. L. Mencken Research Fellow at the Cato Institute and is a regular correspondent for The Atlantic Monthly, The American Spectator, and The Weekly Standard, and frequent panelist on National Public Radio's game show Wait Wait... Don't Tell Me!. Since 2011 O'Rourke has been a columnist at The Daily Beast. In the United Kingdom, he is known as the face of a long-running series of television advertisements for British Airways in the 1990s.